If you are lucky enough to live in a warm climate, you can grow your own. Henna will only grow well in areas where the temperature stays above 50 degrees Fahrenheit, which means that most of us in the United States are out of luck when it comes to growing it ourselves, unless you've got a heated green house. If you can't grow it, you'll have to buy it somewhere. 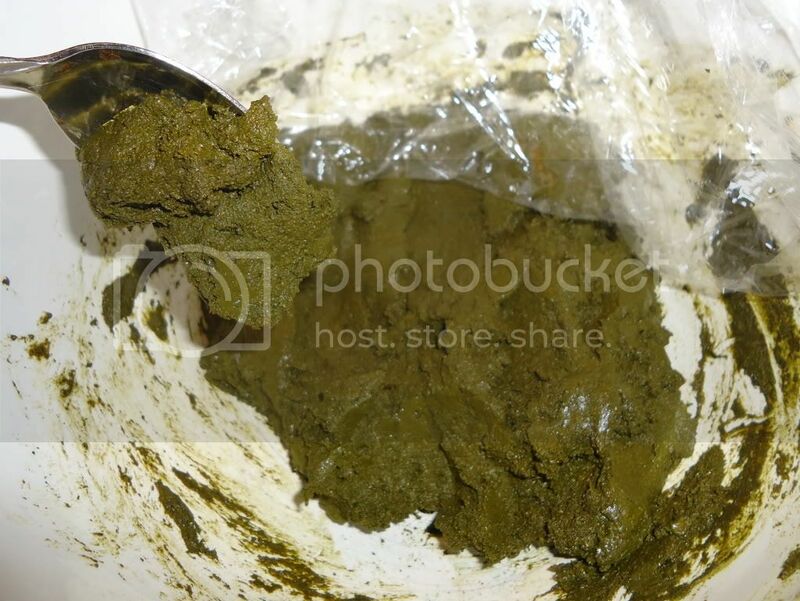 I found my henna online at Bulk Herb Store, but it is sold on plenty of other sites if you search. You want to be sure to buy it from a reputable source so that the henna is of good quality--old henna or henna with junk added to it isn't what you want. Look for "Body Art Quality" henna. The amount you will need to buy depends on how much hair you have. My hair goes down a couple inches past my shoulders, so I used 200 grams of henna. As it turns out, I probably could have gotten by with less (maybe 150 grams), but I suppose it is better to have a little too much that too little. Plus, from what I understand, if you have leftover henna paste, you can freeze it to use at a later time. How can I use henna to color my hair? Be prepared for a bit of a lengthy process if you are using henna. You must mix the henna with an acidic liquid to release the dye, and this can take from 12 hours to up to a couple days. Then, once the dye has been released, you will need to let it sit on your hair for at least four hours--so don't plan anything the day you henna your hair! Following is the recipe I used, along with the steps I took to color my hair with henna. I am by no means an expert at this--far from it, in fact! This was my first time using henna, and I just wanted to share my experience. I made up a recipe based on the research I did before-hand. I have included some extra ingredients, like egg, olive oil, beetroot powder, and black walnut powder. These ingredients are not necessary to henna your hair; they were just extras that I felt like trying. The egg and oil were added for some extra conditioning. I added the beetroot powder because I had read that the first couple days after dying with henna, the hair can look very orange-y (the orange mellows a bit after a couple days to a nice red), and I thought the beetroot would help to add a bit more red and counteract that effect. I added the powdered black walnut because I wanted more of an auburn color rather than red, and was hoping it would help to achieve that particular shade I was looking for. In all honesty, I don't know if any of my additions really made a difference, but it didn't seem to hurt anything either. You definitely need an acidic liquid to release the dye in the plant. In my case, I used vinegar, but from what I've read, there are a wide variety of liquids that can be used, including orange juice, lemon juice, and even wine. I use vinegar on my hair regularly because it does such a nice job of softening and making it shiny. However, vinegar is not for all hair types. If you are unsure, I would only use a couple tablespoons of vinegar, and add enough water to make a cup. Henna ONLY stains a color in the range of orange, red, brown, cinnamon, brick, chocolate or coffee. If you've never used henna before, you may want to do a skin test to be sure you're not allergic. The allergy is called a "napthoquinone sensitivity". If you put henna on your skin, and in 1 hour have itching, a tight chest, or wheezing, you have a napthoquinone sensitivity and you should not ever use henna. 1. Place the henna in a large non-reactive bowl. Add the egg and olive oil. Mix in the vinegar a little at a time until a paste is formed; it will be the consistency of mashed potatoes. 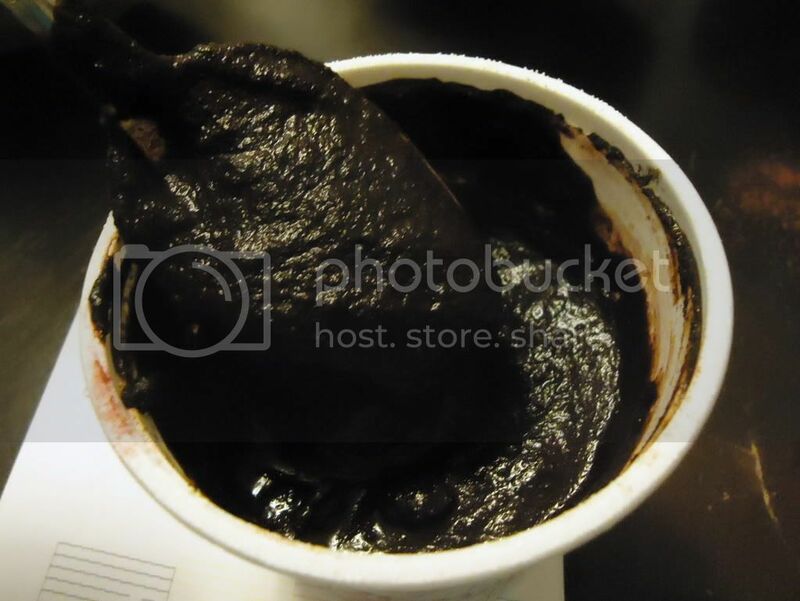 Here we have a bowl of poop. No, just kidding. That's what my husband said it was. It's actually henna powder mixed with egg, olive oil, and vinegar. It is the consistency of mashed potatoes. 2. Cover the bowl and allow it to sit in a warm spot for at least 12 hours or up to 2 days. The paste will turn a brownish color when it is ready. There is a very helpful chart at The Henna Page illustrating the length of time needed for dye release. 3. Meanwhile, in a small bowl, combine the black walnut powder, beetroot powder, and 1/2 cup hot water. Stir well. Cover, and allow to sit until the henna paste is ready. This is the black walnut powder, beetroot powder, and hot water getting mixed. 4. Once the henna has released it's dye, add the walnut/beetroot mix to the henna and stir until well combined. Add the remaining hot water, a tablespoon at a time, until the mixture is creamy like yogurt. Be sure it doesn't become too runny; a runny mix will be messy to apply. Well, messier. 5. Cover your work area with newspaper, protect your hands with gloves, and apply a light coating of olive oil along the hairline to prevent dying your skin. 6. You can wash your hair if you'd like, or just spray it with a water-filled spray bottle until the hair is damp. Begin applying the henna paste to your hair in sections. Be sure to thoroughly coat all of your hair. Henna paste will not saturate the hair like commercial hair dyes; you will likely need to separate clumps of hair and apply more henna to be sure all the hair is covered. 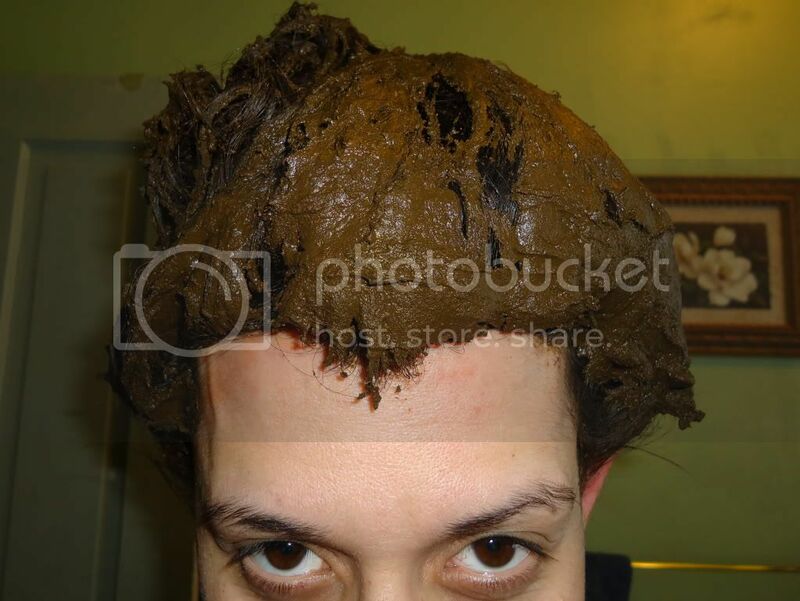 And here I am with poop on my head. No, just kidding. It's only the henna paste. My husband said I looked like a poop head though. 7. Once your hair is completely saturated with the henna paste, pile it on top of your head, and wrap your hair in plastic wrap. 8. You can then wrap your head with an old towel if desired. 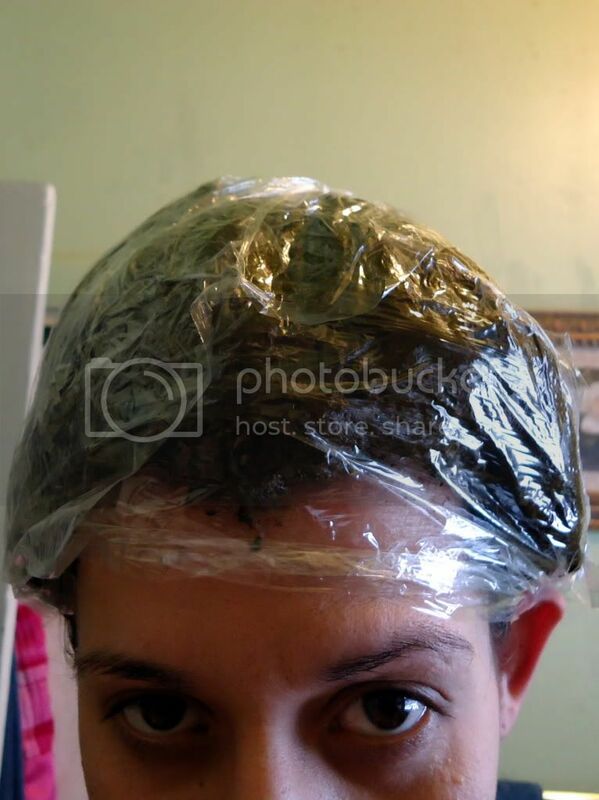 Allow the dye to sit on for at least four hours. Leaving it on longer won't hurt anything--I ended up leaving mine on for five hours. 9. Rinse the henna out of your hair. I did this on my hands and knees in the shower, and used some cheap conditioner to help remove the paste. Once the henna is completely rinsed out, you're finished! All in all, I was pleased with the results. Since I have dark hair, the color change was not dramatic, but noticeable, and I like the shade. From what I have read, the more you use henna, the more red your hair will become over time. It seems that you can use henna as often as you like without having to worry about hair damage. I think I will give it another go in a month or so--if I'm not too busy taking care of babies by then! Wait at least 2 days before your first shampoo. After that, if you can shampoo every other day instead of every day, that will preserve your new color better. Be sure to use a color-safe shampoo. Some brands to try are Pureology, Aveda, Jason, Arbonne, and Aquage, among many others. Ooh, and thanks for the heads-up on the henna sensitivity; I think I'll edit in a little warning. Actually, henna does fade only it does so very slowly and very slightly. I like to wait a few days before washing at all after using henna and then use only conditioner for a week or so after that. Even then, I still have the lovely color on my towel for about a week after using henna. I also take before and after pics of my hair. The color immediately after using henna is noticeably brighter than it is several months later. It is still very red, however, even several months later. It looks like the wonderful red will probably never leave entirely, though it does lesson over time. And, yes, it does become brighter red every time I use it as the effect is cumulative. Also, the conditioning effect from henna is amazing! This does lesson over time from repeated washing but for at least a few weeks, (as long as the henna odor remains), my hair is luscious after using henna.